On November 22, 2010, I wrote about a University of Southern California student named Teague Egan. 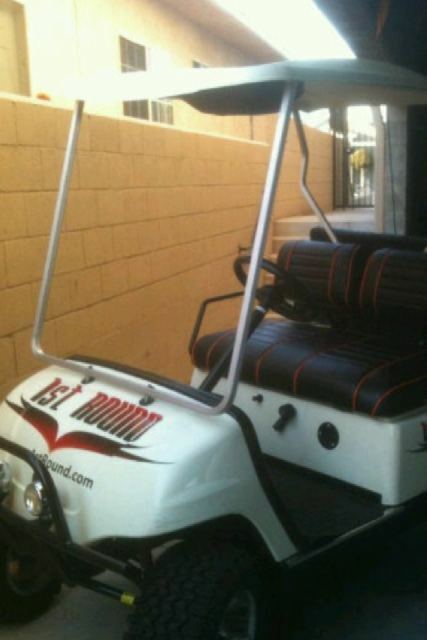 Egan, who is licensed by the NFL Players Association, was found to have given Dillon Baxter (a student-athlete at USC), a ride on his golf cart, which prominently displays the logo of his company (as seen at the bottom of this post). A lot of people started wondering 1) How an undergraduate student passed through the NFLPA inspection and earned certification (there is a loophole to the union’s post-graduate degree requirement for “sufficient negotiating experience); 2) Whether there was an issue regarding going into this type of sports business with a current student-athlete; and 3) Teague Egan’s background. Yesterday, I had the opportunity to speak at length with Teague Michael Egan, who was rather receptive to speaking to me on the record. After letting the media talk for the past week or so, Egan was ready to tell his story. Egan was home for the Thanksgiving holiday, and was not taking a break from trying to build his company, 1st Round. In fact, he was headed to Pine Crest High School, one of the two high schools in South Florida that he attended prior to enrolling at USC. Pine Crest has an exceptionally talented basketball program; University of Kentucky freshman Brandon Knightis a graduate of Pine Crest. Later that day, Egan planned on visiting St. Thomas Aquinas, the second South Florida high school he attended. He was on the school’s golf and track team; St. Thomas is known nationwide as having one of, if not the, toughest football programs. Egan was born on July 6, 1988, making him 22-years-young at the date of this article being published. I believe that Egan felt comfortable speaking with me, as I had also started my own sports agency at the age of 22, as an undergraduate at the University of Florida. The following contains the parts of our discussion that have not yet been mentioned. Darren Heitner: Why did you transfer from Pine Crest to St. Thomas Aquinas in high school? Teague Egan: I transfered from Pine Crest to St. Thomas Aquinas in my Junior Year. My brother [Riley Egan] wanted to transfer because St. Thomas had a much better track team, which ended up winning the state championship after the transfer. I was and still am very close with my brother, and I wanted to go where he went. My brother runs the Pictures Division of 1st Round. Heitner: What gave you the idea to start 1st Round? Egan: I was in between businesses. I had started a couple businesses in high school and college. These were big business ideas. I felt like like I was over my head, though. I had just pledged a fraternity called Phi Psi. Sterling Brewster was in my pledge class; he became a partner in 1st Round. A couple of football players also pledged the same fraternity. Daniel Harper, Everson Griffen (drafted by the Minnesota Vikings in the 4th round, but Egan referenced him as a projected 1st round pick), Spencer Spiegel, and Jordan Campbell all pledged with me. I became great friends with Everson, Daniel, and Jordan. In the Spring of Sophomore year, I went to Jordan and said that should start a business. I came up with the name “1st Round” because a lot of my boys were going to be drafted in the 1st Round, and I thought it was cool. I grew up with signed helmets, footballs, and jerseys all over my room. I played 5 sports in high school. I had season tickets to the Heat and Dolphins. I loved sports. I started throwing parties with Jordan. We went head-to-head with 28th Street Entertainment (Egan stated that this was USC’s top nightlife promotion group). We threw an entire party for free, but negotiated a huge percentage of the bar. We provided free transportation to club, free admission, and blew 28th Street out of the water. The party was packed with hundreds of kids from USC, UCLA, and LMU. We lost money on the party, but 1st Round Entertainment was officially established. I was busy throwing parties, having great times with friends, and had an “in” with all the cutest girls. All of Jordan’s friends on the USC football team started coming to my parties as well. That summer, I was up on Nantucket Island on the beach hanging out on the 4th of July. One of the guys I brought out to the beach was the best freestyle rapper I knew. It suddenly hit me that that I wanted to start a record label. At the time, I was questioning the success of 1st Round Entertainment, because I was throwing fun parties, but losing money. But I had a good name. I started the record label and signed Sam Adams (the freestyler who accompanied him to the beach). I first named my record label “Lazy Boy Records.” I decided to change it, though, and make all of my companies reflect the 1st Round Brand. I made the decision to do so after reading a book about branding that was written by Richard Branson. I liked the whole “Virgin” idea and keeping everything under the same brand. In the near future, I will be doing a management deal with Lady Gaga’s management, for Sam Adams. Anyway, when Jordan transferred to Louisville, we started the sports agency. The division is far bigger than negotiating 3% for the athletes we represent. We want the sports division to be the next Nike. We don’t want to just deal with contract negotiation. Instead, we want to manufacture merchandise and apparel. I structured 1st Round after Nike. Nike has the swoosh, 1st Round has the wings; easily identifiable. The slogan is also based after Nike. Theirs – “Just Do It” vs. ours – “Go Higher” – everyone can identify and relate to it. Heitner: But it does seem like you also want to represent athletes, no? Egan: I officially became certified by the NFLPA on October 1, 2010. My Nike goal is down the road. I want 1st Round to be a “full service sports franchise.” The word “agent” has such a negative connotation. We will provide anything the athlete can want. I want to do a lot of athlete branding. Heitner: What is the make-up of your company? Egan: I structured my company with 6 different divisions. Each division has a different President. I also incorporated the “crossover effect,” where each division can help out the others. Sports, records, pictures, entertainment (parties, but I eventually plan to own restaurants, clubs, entertainment venues), capital, and philanthropic. Heitner: Tell me a little more about your capital division. Egan: This division began based on my and my dad’s background. I have has several investments in many fields, stocks and bonds (he says that Apple is his biggest holding), money in BlackRock, global allocation funds. The main area that I am looking at is venture capital and investments into small, upcoming businesses that have huge potential for growth. Heitner: What are your thoughts on what has been written about you thus far? Heitner: People are calling out the NFLPA for granting you certification while you are a still a student. What do you have to say about that? Egan: Athletes should be able to have whoever they want represent them, as long as the person has experience and capability to represent properly. The fact that I am a student should not prevent me from representing an athlete. If a student has sufficient negotiating experience that meets the qualifications the NFLPA deems acceptable, there is no reason he should be denied. I am a born negotiator. I have a lot of negotiating experience. Heitner: What about the criticism regarding Jordan Campbell, a current student-athlete, being a part of your organization? Egan: Jordan never actually signed the LLC documents. I believed that it was a bad idea and a potential conflict. I am going to wait until after his eligibility to make him an official partner. Heitner: What is your plan for 1st Round Sports in the immediate future? Are you going to wait until the criticism subsides before you go out and recruit players? Egan: Now that this all happened, I have to watch myself and stay within the rules even tighter, but I am not going to sit back. The #1 thing was to make sure that my friends did not get hurt. Now that they are back and reinstated, I feel free to talk with the media. I will be putting the golf cart up on Ebay and will have some of the proceeds go back to USC Football. I am looking at baseball and basketball on top of football, and already represent an MMA fighter (Ryan McMahon) and have connections to the UFC. Heitner: What about the threat of getting in trouble for rules violations? Egan: Rides to clubs, free entry to clubs, and golf rides around campus were given to everybody. There was no special treatment being given to athletes. Heitner: What kind of advice would you like to give people who dream of becoming sports agents? Egan: It’s all about relationships. How is anyone supposed to be a sports agent if he is not friends with the athletes and is some random 30 or 40 year old guy? It is all about trust. I have amazing relationships with the guys. They know and trust me. It’s not the grades you make, it’s the hands you shake.